The European interior motif sets, the tone for this brand new project The Elegance Court, we provenient, magnificent and luxurious Accommodation in the midst of commercial area of Bangkok. 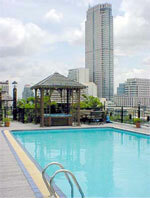 Remark : - Extra bed charge at Baht 600 :- net inclusive of American Breakfast. *** All rates are included of American Breakfast, Water and Electricity Supply.